5 Trends for 2019 that will shape the future of ERP Solutions. The business environment in present times has become very complicated. The level of competition is increasing. So are the expectations of customers. This makes essential that businesses use their resources efficiently. This is possible only through the integration of technology with business operations. It can help not only reduce the wastage of resources but also help modernize the functions. One such technology that can help the businesses streamline the operations is ERP. ERP is essential for a modern-day business. There are professional ERP solution providers to help with your requirements. With the breakneck pace at which technology is evolving, ERP is undergoing a host of changes. Let’s have a look at the trends that will define the future of ERP solutions. ERP or Enterprise Resource Planning platforms are also evolving. With the changes in business requirements, ERP is also changing. Businesses now prefer cloud-based ERP. As per a recent survey, more than 94% of enterprises regard cloud-based ERP as a safer option. ERP systems are becoming more dynamic. They can now take care of all organizational functions. Do you already have an ERP system in place or are looking to get one for your business? 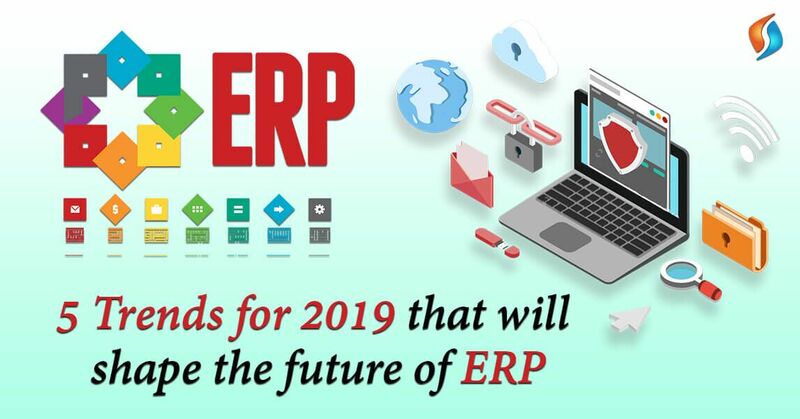 Then you need to know about the trends that will shape the future of ERP in 2019. The year 2018 saw the movement of several software platforms to the cloud. Till now ERP is lagging with the integration of cloud computing. In the year 2019, expectations are ripe that more ERP users will switch to the cloud. This trend holds great importance for small to medium businesses. With cloud ERP solutions, they need not maintain in-house infrastructure. They can avail the benefits of a comprehensive system with minimal human resources. It will help them access ERP systems which they cannot afford. As per recent reports, a total cloud-based market with cross the levels of US $411 billion by 2020. This trend has found favor with big corporations also. They are availing enterprise mobility solutions for their cloud ERP requirements. With the rising trend of cloud ERP solutions, there are going to be more updates available. This will need the businesses to keep their personnel always ready. They cannot rely on an old-release version for much longer. To be prepared for one big release, the company will have to adapt to many smaller releases. This will help reduce the steep learning curve between the systems. It will need businesses to invest in staff training and upgrading of skills. Meeting these demands is possible with the help of mobile ERP solutions. Blockchain has found takers in various enterprise software. It will find its way in the ERP also. The blockchain is one of the most secure platforms for carrying out transactions. Though, it is only in the nascent stages right now. But the future of ERP will feature blockchain. Specific organizational functions can become more efficient with blockchain. Supply chain management and customer acquisition will become more active with this technology. Many companies where shipping and tracking are essential functions have started using the services of blockchain consulting firms. You can enlist the services of enterprise app development providers. They will help integrate blockchain with your ERP. Artificial Intelligence services are impacting every facet of business operations. The concept of machine learning is going to revolutionize ERP. It will help businesses achieve high levels of automation. It will replace the need for human resources across various functions. The concept of robotic process automation (RPA) is catching up. Whereas previous systems focused on specific processes, RPA is applicable across all departments. This will help the company reallocate wasteful human resources to more productive avenues. The expense of software and hardware will reduce for the company. Reallocation of funds will be towards business automation. Companies offering Enterprise mobile application development in India can take care of this. As per the ERP system predictions for the next 10 years, businesses will opt for personalization instead of customization in ERP. It will help them stay up to date with the industry trends. Business users will look for personalization of solutions instead of modifications. It provides the company with a specialized solution at a fraction of the cost. The market for personalized ERP solutions will cross the US $ 15 billion by 2020, as per a report by Forrester’s. Companies can reduce the need for dedicated IT teams to manage ERP. In the future, all the activities of ERP will focus more on customers. Join hands with the best ERP solutions provider in India! As technology is evolving, so are the business processes. This is why ERP systems also need to grow at the same pace. Henceforth, companies investing in ERP need to be more flexible so that they can adapt to the changes. It is essential for companies to incorporate all the new updates in ERP. As such, they will have to increase the focus on ERP implementation. This requires thorough research on their part to identify the best system. Are you looking for expert enterprise mobility management services? At Signity Solutions, we offer professional enterprise app development services for our clients. Our team has many years of experience in providing personalized ERP solutions. So, whatever may be your requirements, we can handle them with ease. Get in touch with our IT outsourcing services team now and let us partner you with your ERP requirements. Contact us now. Send us your requirements. We will get back to you with a free quote.. Copyright © 2018 Signity Software Solutions. All Rights Reserved.